We really don’t know how individual people behave or understand why they display certain behavior patterns. We have difficulties in building contextually relevant contact with people engaged in their own activities. In our modern communication forms we still suffer from a serious relevance-mismatch syndrome. Indeed, very few would argue, that future businesses and governmental services could manage without relevant knowledge of human behaviors. There are a plethora of studies, statistical frameworks and mappings of everyday habits and behaviors, but typically they touch only the surface and have problems in discovering the relevant meanings and contexts of individual life. Personal motivations and intentions of individuals appear as unknown universes of human life. Computationally, it is almost impossible to detect and reveal individually relevant behaviors and their personal meanings even though each individual could easily provide this information, if allowed to do so. In order to manage this computational challenge ingenious data mining systems are created for intelligent business, marketing, political, and other purposes in order to ‘dig out’ the underlying behaviors like purchasing patterns, voting, preferences, eating, driving and numerous other habits. The aim, of course, is to benefit from this knowledge in many commercial, societal, health-related, political, and other informative or predictive ways. Big Data explosion has made data mining tools an indispensable and necessary resource for almost any organization. But interestingly, a definition of Big Data is that it overpowers any available computing systems. The increase in the amount and diversity of personal and other data generated is faster than the evolution of computing power. In near future, data about individuals increases perhaps exponentially so the question arises, can something be done to alleviate this computational complexity? There is a clear paradigmatic hindrance, the shared, underlying assumption that relevant behavior patterns and their meanings are hidden and private information and that in order to get access to it, clever data processing schemes or even objective (physiological recordings) must be used. Many seem to think that it is too expensive and complicated to collect data directly from individuals. It is my common experience to hear claims that you cannot trust what people tell or indicate. But nothing could be farther from the truth: why else would we talk to each other, read what we write to each other? We could do even more. We can make the problem easier to solve by letting people help us. I believe that in a near future this will be understood and there will be an explosion of apps and services that rely on getting relevant guidance and information directly from individuals and communities in order to provide best possible responses, data access, communication, information, interaction, entertainment, services and function. It will be a major computational paradigm shift, but there are some major steps to be taken before that. The following offers one such step. Imagine that it were possible to provide a means for people to indicate – in as much detail, style and color as they want – what they are doing (going to a shop), how and why they do it (just to hang around), and how (e.g. only to friends) they are ready to share it. Imagine then that we allow access to these instances or episodes composed of specific and exactly defined behavior patterns, by using a specific address reserved to them? The Internet of Behaviors (IB) is exactly for this purpose. My core idea behind IB is to offer individuals and/or communities a new means to indicate selected and meaningful behavior patters, as many as they like, by assigning a specific IB address (analogous to the internet of things) to each behavior (‘behavior’ can be a thought pattern as well, if someone could find that interesting or useful: “I’m right now dreaming of IB designs”) pattern just as the person or community sees as best. When this assignment has been done, automatically or by individuals themselves or by external observers or by learning systems, then it is possible to access these individuals engaged with these specific behaviors, to connect with their gear then, or to provide their environment information about their behaviors – if they allow it. Naturally, IB history data can be available as well. The design of a possible IB device or devices is a delicious challenge. It is up to individuals and communities or teams to design the coding schemes related to any behaviors that they see interesting, relevant or valuable. But there could be a major opportunity for commercial IB coding scheme providers to help them. As an example, major brand owners will surely get seriously interested in this possibility: a brand-relevant gateway to their customers during selected life episodes. Of course, IB offers a huge new communication scheme because it means that we can become aware of other people’s activities and state, in a very detailed way, much better than is possible today. Warfare and situational awareness building is a scary application example as well. As a very simple positive example, a sportsperson and his/her coach could design a scheme (or obtain it from an interested operator/provider) specific for each of the exercises, its components and the training episodes that they see relevant and which they want to systematically map and follow, in real time if needed and synchronized with other recordings, timing, data collection and indicating devices. The coded episodes or behavior patterns can be as complex as needed and the main thing is that each of these patterns has a unique address assigned to it. The codes could also be used to integrate the data from a number of sportspersons and be compared, contrasted or analyzed in any interesting way. Having this code system publicly available would make it interesting material to viewers interested in that sport. Of course, if thousands of sportsmen in the same sports would share an address system (set of patterns) it becomes possible to collect, compare, compute, and map large amounts of relevant data for any purposes. Imagination is the limit. IB points always to a relevant and meaningful (often ongoing) aspect of behavior, which can be anything, a large or small detail, that is seen as important or valuable. No need to have artificial intelligence mining systems available because data has been coded on the run already and in a way that is relevant. Computational power can be used for more demanding tasks. Imagine the use of IB codes in retrieving any relevant (coded-on-the-run) streams and clips from massive video banks. Codes could be ready-made for specific video purposes, related to content or occasion or other contextual aspects, we could have our own code systems provided by various interested operators, and coding in the video case could be done by the presenter or by video editors or automatically when feasible. Patients have often difficulties in memorizing and describing what they were doing when they had an attack or how they were recovering over time in various every-day activities. Even with effective real-time physiological, gps, emergency and other recording systems, relevant and meaningful incidences or episodes or episode histories in life can be most valuable for medical purposes. Coding of natural behaviors at home, for example, is not a massive technical problem and can be accomplished in a number of ways for this purpose. When a person indicates a specific behavior pattern (watching tv, biking to work, writing a book on “X”) with an IB address it means that IB ‘knows’ exactly – without guessing or data mining involved – what he/she is engaged with, and if required it can provide relevant information to the specific context and environment, or to any digital system or to other people if it is so decided. IB knows us. IB is a gold mine to intelligent UIs. Someone may claim that all IP addresses are already exhausted. True in IPv4, but there is a schemes according to which (IPv6) we could have 2128 addresses, which could offer each person millions of addresses for his/her use. I can imagine that in my own life, for example, if I would want to cover the most relevant aspects of it with IB codes, the number of addresses for general behavior patterns (like writing an article, cleaning the house, bench pressing at the gym, meeting a colleague, visiting our local organic farm, buying a product, reading a book, taking my vitamin pills) would not be more than 10000 that I could dynamically use for variable purposes. 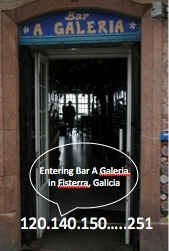 In the quick and dirty and naive photo examples shown here I was thinking of my personal history in Fisterra, Galicia where I spent a fascinating time especially in Bar A Galleria where I had a number of memorable experiences and of which I have just finished a book. What a great help IB would have been for recording my ‘behavior patterns’ there and returning back to it in writing the book. I can only imagine the value of having friends and companions there who had shared their IB with me. Perhaps this will happen one day. Of course there is the challenge of actively using the codes, but there are ways to do it – everyone can imagine it – some are straightforward and can be made automatic and some are probably more complex. Recurring routines, for example, could be easily coded and we could have a supervised and even unsupervised learning systems to help us effectively to build the personal coding systems for the elderly, for example. Synchronizing IB with other digital gadgets is really a delicious thought exercise. Imagine, for example, that you have a set of IBs that have been developed in a specific work activity at your office. When you ‘turn on’ this IB (a series of behavior patterns are coded), everything at your office, including your mobile phone, computer, your colleagues, knows what you are up to, when you approach a meeting room or your computer, for example and they can be prepared for it. In a sense, IB is a context magician that allows you to be received according to your contextual interests and needs. We could soon have commercial providers of IB addresses and recording schemes on the market: these new type of operators would offer ready made innovative behavior mapping schemes and tools for us to use. If they are fun and clever we would be ready to use them in different aspects of our life, and to be good customers. The most basic property of IB is that it produces a map of and remote access to relevant individual behavior patterns and their history any time that this history is valuableand available e.g. if I decide to assign an IB code to my typing of my book “Writing book X” then by activating that IB code my computer could start where I last time left writing. The same goes with any activity, with any complexity and significance. The real power of IB is that it provides us an access to relevant and meaningful behaviors. In other words, it creates an intelligent gateway to anything that we see as important or valuable behavior in our lives. But it is dependent on our way to code these patterns, and that task is a creative joy as many of the Quantified Self community (http://quantifiedself.com/) people know. Relevance is the key in IB, not its exact accuracy. This is where IB differs from standard technological systems and IPs. IB is human-centered and relevance there is the key to everything. Naturally there will be problems of detail, use and information load and complexity, but it is possible to start where it is feasible and there are already now a huge number of such possibilities, not least in mobile phone industry. The door to imagination is open! Finally, just a few days ago I was reading a fascinating blog (http://blog.stephenwolfram.com/2012/03/the-personal-analytics-of-my-life/) by Stephen Wolfram where he tells how he has collected an immense amount data of his daily activities over a couple of years. He is an admirable and creative person but how much more could we learn from him if he had available an IB-based system to record his critical behavior patterns, intentions and meanings in doing what he does. It would be a gift to us and not only of his life, but there would also be others who could innovate IB schemes to share their creativity and knowledge. But first we have to innovate the IB. Professor, may I suggest that you are being a bit naive? People accepted the “openness” of face book without question at first, but now are beginning to see the downside of living life online. In your “Internet of Behaviors” are there not huge potentials for those who wish to invade the privacy of others? Or, perhaps worse, creeping corporatism is offered one more window into our souls in which to display marketing information. As you yourself say: …major brand owners will surely get seriously interested in this possibility: a brand-relevant gateway to their customers during selected life episodes While you may see this as a positive (perhaps because you are seeing it from the “brand owners'” perspective), quite frankly, it chills me…because I am not a brand owner nor an advocate for them. Ah, professor…I’ve searched for some time now and finally found the quote I had in mind –one of them anyway–which illustrates what I believe is the dangerous nature of your approach. Scary, I agree and still it is possible to use the same powers for good: knowing better when and whom to help, react when people indicate they want it and so forth. But thanks for the quote and reminder! Indeed a thought provoking post! I believe your approach with letting the coding of behaviour be done by humans and not by machines be the most fruitful solution. I suppose it would be supported also by what philosopher David Weinberger writes in Everything is miscellaneous, aswell. The meaning of our behaviours would, I believe, become a matter of the context – and the richer the context (as in more tags) the more easily communicated would the particual behaviour be in terms of it´s meaning. However, having taken an interest in psychographic analysis of social media content for quite some time now, and again and again been confronted with my own ethical hesitancies even with such in comparison shallow data, I also believe that the permission solutions you mention would be an extremely vital part of the Internet of behaviours. I find it of uttermost importance that the privacy concerns of individuals are taken into account before this type of (information) technology is made public. Do you have any ideas about such solutions in regards to your ideas? You are the second commentator who shares the worry of privacy & ethical care. It is a good reminder. I have a long history in psychology where it is everyday practice to arrange various types of individual data collection and to approve all these research set-ups in ethical committees etc. But opening the gates to individual behaviors requires something stronger, I agree. I’m preparing another blog on the IB issue and after these comments, I’ll try to open this thinking. Perhaps the thought experiment with IB will put special emphasis n protection of individuals. Actually originally these ideas come from my participation in the Peace Innovation project (Stanford :)Thank you for the DW link as well. 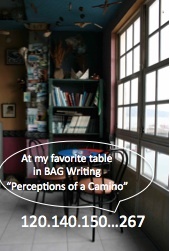 You are currently reading Internet of behaviors (IB) at Gote Nyman's (gotepoem) Blog.